Henry Danton - Ballet History and Music - Ballet Alert! Does anyone know who Henry Danton was? He's my teacher, and he's not very well known in today's time, but in the 40's and 50's he was quite famous....consider this a scavenger hunt for info, if you have time to surf the net and stuff....I'll letcha know if you're right! Henry Danton was a Principal Dancer of the Sadler's Wells Ballet, and one of the originators of "Symphonic Variations". His name comes up from time to time on Ballet History and Dancers. Run a search using his name. Wow! I didn't think anyone would be interested in this! Do you know Mr. Danton personally? Just wondering. I can't find the earlier posts about Mr. Danton. I tried searching, but it only gave me this. Did you check the "Dancers" forum in the General discussion? And there was a post not all that long ago on Adult Ballet Students. As to knowing Mr. Danton, I have not had the honor. (real name, Henry Down), dancer b. Bedford, England, 1919. Educated at Wellington College and Royal Military Academy (Woolrich). After three and a half years in military service started to study dance (1940) with Judith Espinosa, Vera Volkova, Victor Gsovsky, Egorova, Kniasief, Rosanne. Soloist "International Ballet" (1942-43) dancing Prince (Swan Lake), Les Sylphides; Sadler's Wells Ballet (1943-46), dancing Florestan (Sleeping Beauty), The Rake's Progress, Les Patineurs, pas de trois from Swan Lake, Les Sylphides, etc. Created Dragonfly (Spider's Banquet), role in Symphonic Variations. Left Sadler's Wells in 1946 to continue studies in Paris. Has also appeared with small ballet companies. This Encyclopedia was published in 1949. Yep! That's him! Thanks alot! It shows that a wonderful teacher's name isn't lost after all! Henry Danton taught in NY in the 1960's and perhaps early70's. Where is he now? He was an absolutely pivotal model in many young dancers' development. I would love to be able to communicate that to him. He instilled great love for dance and absolute stoicism en pointe--no foam, no lambswool between your toes and the floor. he is, to the best of my information, working now with BALLET THEATRE OF SCRANTON (in PA) and working on a staging of THE SLEEPING BEAUTY for this group. he's also teaching somewhere in OH. And if for some reason, you need to remember the original cast of "Symphonic Variations", sing the names to the opening theme of the music: "Margot Fon-teyn, Moira Shear-er, Michael SOMES, Brian SHAW, Henry DAN-ton. (new phrase) and PAM-ela May...."
Yes he is teaching with ballet Theatr of Scranton on Mondays, then teaching for Toledo Classical Ballet in Oh Wed-Fri. He is still very active and an inspiration to all who take classes with him. He just finished staging The Sleeping Beauty for BTS, and will be working with TCB on their Swan Lake and Paquita. Exactly what Alastair Macaulay said! And as Igor Stravinsky said: "Since you're going to steal anyway, steal from the best!" 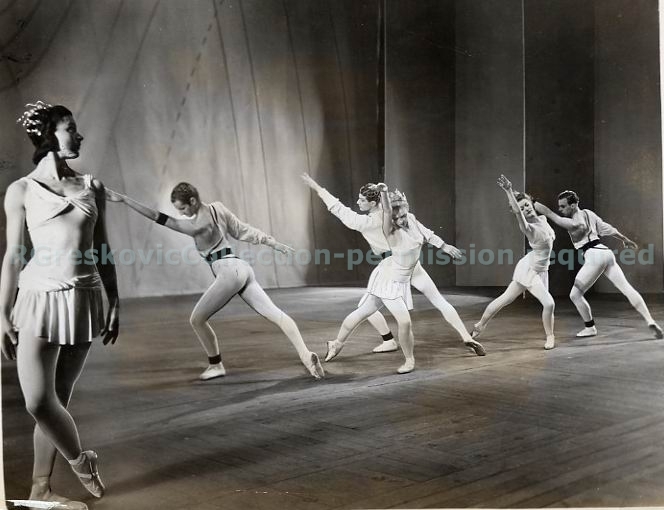 the attached scan is not unfamiliar from books but this is the first photo print i've seen (other than postcard fotos) of the first cast of SYMPHONIC VARIATIONS - Danton is the first on the left in the line-up beyond the standing figure of Fonteyn, which would, i guess, qualify him as her 'partner' in ashton's scheme. He doesn't seem to have much turnout in his right leg, even compared to everyone else. What year was this photo taken? I'd say you'd have to know more about how this picture was taken, whether it was posed or in motion, and whether he was totally in sync with everyone else before being able to make a statement about his turnout. You're right. I was also comparing the head and arms between the two girls in the back. I'm more attracted to the second one because it seems more open. Although the first reminds me of Giselle or Swan Lake. And here is Mr. Danton in the same company's production of David Lichine's Protee, also in 1952.
the photo of HD in SYMPHONIC V was likely take in 1946 or soon thereafter. Henry Danton was one of the stars in a programme shown on BBC television last night, focusing on the way the Sadler's Wells Ballet matured during WW2. He's 93, looks amazing, talks with humour and sense - terrific! And the programme also included a precious few seconds of the dress rehearsal of Symphonic Variations, including Danton - it was a revelation, so much more freely danced than we see it today (although of course I know it was a rehearsal and therefore not necessarily what the first-night audience saw). The programme also included interviews with Julia Farron (also 93, and the last survivor of the company's near-disastrous tour of Holland in the early days of the war) and with Beryl Grey (86), Gillian Lynne (88) and Pauline Clayden (91), all of them exceptionally articulate and fascinating. A lovely programme! At 95 years old, Mr. Danton is still teaching in MS in Hattiesburg, Laurel, and Columbia. You can read a complete bio at http://en.wikipedia.org/wiki/Henry_Danton. Reviving an old topic. Wanted to let everyone know that Henry Danton celebrated his 100th birthday on March 30. He is still teaching almost daily, still travels on his own, and is as sharp and witty as ever. He is an amazing man to know and am grateful for the time I’ve been ablet to spend with him, talking and learning about both ballet and life in general. Such an inspiration! Thank you so much for updating us on Mr. Danton, Fraildove. This is great news. So glad to hear he is doing well and best wishes for his health and happiness!